Two years ago at this time we knew the name Katrina as a beautiful feminine name. Suddenly on August 27, that changed and Katrina became known as one of the great disasters of the world. 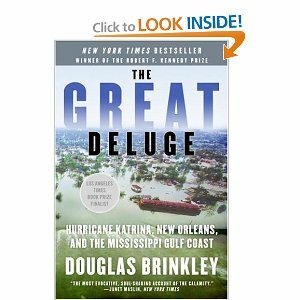 I know that to be true—I was there—and so was Douglas Brinkley who wrote Katrina’s biography. I have put off reviewing this book because I thought it might be too painful but now that I am sitting down and writing, I realize that this review could become the catharsis I have needed. It is hard for me to believe that it is already two years ago and that I am in Little Rock, Arkansas and not back in New Orleans. Be that as it may, reading about Katrina is not easy but I did notice today at Barnes and Noble that I may be reading about her for a while—it seems there are a slew of new books out about the storm and this is just the beginning.